In the 2014 film “I Origins”, there is a short but profound scene with the protagonist, an agnostic scientist, who is experimenting with the DNA of a specific type of earthworm that is born completely blind; in fact, with no genetic capability of sight at all. He is attempting to manipulate the DNA so that he can force the earthworms to pass on the genetic traits for an eye to their offspring and thus demonstrate how the “eye” as we know it may have evolved. His fiance, who is deeply spiritual and in tune with her individual concept of God, challenges him. Since the earthworm does not have the sense of sight, he is limited in his perceptions, she asks how an earthworm suddenly gaining sight would explain “light” to the other earthworms. As she presses further, she begs him to consider whether it might be possible for some humans to have a rudimentary “sixth sense” that might actually enable them to capture a glimpse of reality outside our normal five senses. And if that is possible, how would they explain their perceptions to the rest of the world? He is confused by what he obviously thinks is a childishly simplistic question but is incapable of delivering a competent answer precisely because altho simplistic, the question just pushed him to think outside of his own perceptual box. With that simple question, she upsets his paradigm with the implication that all that is knowable is not necessarily perceivable by his own limited five senses. He is suddenly challenged with the idea that there might be aspects of reality that exist but we simply are unaware and incapable of conceiving of them because we have no sensory starting point. This was a cinematic moment that perfectly illustrated my own spiritual journey of understanding. It is fiction but it is grounded in a deeply philosophical rock that I have been climbing for a number of years. We humans are limited in our perceptions in so many ways, some of them by our basic DNA but also by our choices (both conscious and unconscious). It's like being given a closed and opaque box. We know there's something inside there but we can't touch, taste, smell, hear, or see it. Do you remember the thrill as a child of being given a beautifully wrapped gift box? In a lot of ways, it rarely matters what is actually inside the box because it can never match the feelings of excited expectation and curiosity. But also, no matter what the gift actually is, it is utterly meaningless until the box is opened. Only then do you begin to appreciate the gift for what it truly is rather than the blind anticipation. Both are true and real feelings but only one is allowed to be fully actualized. If you never unwrap your gift and open the box, allowing the real gift to be experienced, you will stay in blissful ignorance, distracted by the beautiful trappings others have wrapped it up within, but you will also be missing out on the real and untarnished gift. Now imagine that you have an image of God trapped inside that box and you feel the security of knowing that you have Him inside that box, but the longer you put off opening the box the more comfortable you become just letting it stay wrapped and unopened. Now what if I told you that until you open that box and allow your perception of God to expand outside of that comfortable box you will never touch the face of God or ever reach within to understand who you are in this infinite universe. I believe this imaginary God-box is humanity's trap supplied by the institutionalized church (including Temples, Mosques, and Synagogues as well) and keeps us mired in the muck of confusion and conflict rooted in our battle to stay spiritually stagnant – even though our individual spirits are always craving more even if we choose not to listen. A Venn diagram of three interlocking spheres (of influence). 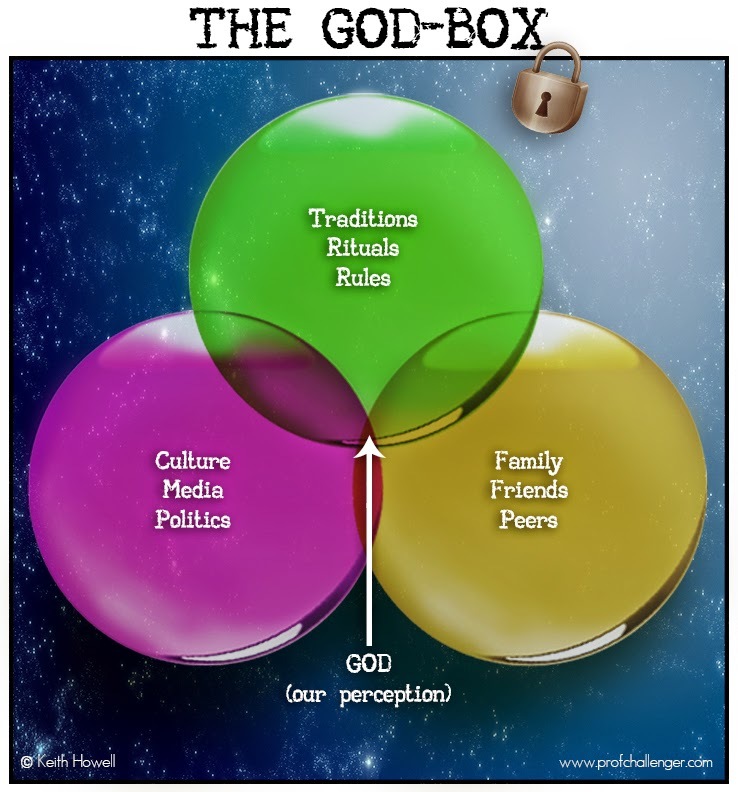 One sphere is labeled “Traditions, Rituals, Rules.” One is labeled “Culture, Media, Politics.” The last is labeled “Family, Friends, Peers.” Where the spheres intersect with each other is labeled “God (perception of).” The entire Venn diagram fits tightly within a square that I call the “God-box.” And this is where those within institutionalized churches are comfortable existing. However, if we would just take that small step to look outside that box we would see an infinite space in which God actually exists, but we cannot perceive Him because we have locked ourselves inside our God-box. Unlike The Doctor's T.A.R.D.I.S., the God-Box is actually smaller on the inside and infinite on the outside. Most people never even glimpse God because they are terrified of ever even looking outside that box, for to go outside the God-box means the very difficult (and sometimes painful) task of introspection and going within. Introspection is not a trait commonly encouraged by the institutions of power that control the flow of information in this world. Growth should be uncomfortable. If you're comfortable where you are then you are not growing and you are probably stagnating. The real Truth in terms of an actual spiritual journey is that it can only come from within us individually for that is ultimately the only place we really can know God's heart – not from printed ink on thin paper and bound by faux leather with our names embossed in gold. I part company with institutionalized church dogma (those beliefs I am supposed to agree to as “sound” and “correct” as defined by other flawed humans) in my view of the Bible because they are circular and self-serving. Institutional churches, by necessity, require some sort of authoritative control over thoughts and behaviors. To accomplish this they must deify the Bible and arbitrarily declare it to be infallible and inerrant. I do not blindly accept the truth expressed by any individual or any institution that asserts such a thing. Perfect knowledge of the spiritual cannot be perfectly produced or understood by imperfect beings and most especially within the context of a hive-minded institution. The Bible is not God's "word". This is a term concocted to end debate with a “God said it. I believe it. And that's that.” type of thinking. What we call the Bible is not “God-breathed” nor is it “God-authored.” By its own terms, Jesus himself is the “Word,” not this disparate collection of writings and letters that range from the metaphysical to the historical to the mythological to the poetic to the prophetic to the didactic. It was not constructed by a magical hand appearing and writing it down. It was not written on golden plates and transcribed by a human. There is most likely some Divine inspiration within the text but Divine inspiration is not inerrant because for it to be expressed it must be filtered through the limited human prism of understanding and the personal biases of the one delivering the inspired thought. Divine inspiration can, and does, happen throughout history and throughout humanity and oftentimes in the most unexpected ways and requires us to seek it out intuitively to glean that inspiration. To believe that God can be captured inside a single antiquated collection or an institutional box of any kind, in fact, possibly borders on the blasphemous from my personal perspective. That being said, I do not discount the importance of the collection as our best preserved source of the oral teachings passed down from Jesus of Nazareth. I accept the Bible as authoritative only in that sense and only so much as I believe the text translations are mostly reliable and accurate (unicorns in the King James Version notwithstanding). I do not believe it has been, or is, properly interpreted or applied by the institutional churches worldwide. My method of interpretation is very simple: I look to the words and the actions of Jesus as an example for my life and the prism through which I read and interpret the rest of the Bible (and other texts as well). What I see in Jesus is a very simple call to authenticity -- to know myself and be true to myself. To seek ever deeper understanding of the world we live in, the way people think and feel, and the spiritual realm. In so doing, I develop empathy and understanding of those around me and as I grow in my understanding of God and myself I can exhibit ever increasing love and grace to those I encounter. This inevitably allows God to shine through me and spread the good news that Jesus has bridged the gap between us (the physical) and God (the spiritual). He is the open door to the Divine. He brought the Kingdom of God to us in the here and now. The good news (gospel) is not really about the future, or eternity but the here and now. What happens in eternity will happen or not, that is beyond our ability to really understand on a human level. But we can understand the world we live in. We can see the suffering. We can see the horrors and the beauty. Jesus did not come to build an institution; all structured churches are entirely man-made -- the modern pharisees. There is value to the gathering of fellow believers to show God's love to each other and to the world. However, as soon as “Roberts Rules of Order” is invoked at a business meeting and task-forces start forming, then a political institution has been created and not the church that Jesus referred to. The institutional church lives on but it's on life support as it attempts to sustain itself as the only source for proper validation of spiritual experience and beliefs. But we all can take comfort that there is no need to have this validated by someone else, even if you adhere to an authoritative view of the Bible from a personal perspective. As Paul explained in his letter to the first-century church in Rome, God's law is written on all of our hearts and our consciences bear witness to it. So, stop looking for external validation. Your own conscience will validate your experience with God and your understanding of Him. My rule of thumb is considering whether the philosophical destinations I arrive at are grounded in increasing humility based in love and understanding of humanity and the world at large or in self-aggrandizing judgment and condemnation of people and people-groups outside my comfort zones. I hold on to the former and work to discard the latter. Jesus came to start a movement based on the two-part highest principle. Love the Lord your God with all your heart and all your mind and all your soul; and Love your neighbor as yourself. Every single other rule, law, prescription, or restriction should be able to fall under this without jumping through the horrific and contradictory hurdles erected by Christian apologetics. In fact, if you need someone else to provide for you books and classes to memorize arguments for your “faith” and “beliefs” then I would question whether you really have a faith or are just trodding the path of the familiar because the unfamiliar is scary. It may sound trite to say "What Would Jesus Do?" But it is the easiest way to suss out what is truly "authoritative" and not just what we want to be authoritative for whatever reason. If you drop your institutional, denominational, and doctrinal walls and simply step back and examine things moment by moment through the highest principle prism -- you will find out just how much we call "Christianity" is nothing more than prejudice, politics, and tribalism draped in the bloody cloak of Jesus Christ. Jesus did not come to tell us to set ourselves apart and above everyone else. If he did then he failed in his example to us. His recorded words and actions are those of someone who expected his followers to be a part of the world around them and not to sit in self-righteous judgment of others who are different. Jesus embraced everyone except the religious hypocrites. Why? Because they were using the religious institutions of the day as a means for greedily enriching themselves as well as a weapon to bully those around them to conform to their own arbitrary interpretations and applications of the accepted holy scriptures of that time (which included some, but not all, of what the modern Christian churches accept as authoritative today). The example of Jesus is one who lived with a culture of religious systems of the time but never conformed to them and instead challenged them to think outside their closed box and embrace the higher principle that this God of love always intended. The community of believers who caught the wave of Jesus' "Good News" were just that, a community, and how did he say the world would know them (us)? "By this everyone will know that you are my disciples, if you love one another." John 13:35. Now do some research of the world outside your local church and ask yourself "How does the world know me(us)?" If God is love, then God is not political; God is not institutional; God is not cultural. If God is love, then God is transcendent and that means unknowable by our physical senses. God requires us to meet him inside. It is only within that we can ever find the key to unlock that box and enter the infinite space God inhabits.